So I have had my GCC for about three weeks now, I have owned and/or worked with dozens of animal species however he is the first bird I've ever owned. Long story short - he was abandoned at my place of work and the nearest bird rescue is over three hours away. I work at a pet store that sells GCC so I have some experience handling them ( it's against policy to take in foreign animals as they may have illness or disease that could spread ) I decided I would take him home with me because I have been wanting to get a bird for some time. For the first week and a half he was the sweetest, most gentle and affectionate bird I had ever handled (I'm used to the GCC at work nipping) however this last week he has done a complete 180 and will suddenly turn very aggressive usually biting hard enough to break skin. He has a very large cage that I leave open all day and a separate playground area connected to it, with ladders leading to the floor so that he can come and go as he pleases when I am home. His favorite spot to sit is on my shoulders/head and just hang out with me as I do my daily tasks. He eats a mix of bird seed, fresh fruits and veggies, millet and nuts. I know you are not supposed to show any reaction to being bitten so I try my best not to and put him in a third slightly smaller cage I have that is the "time out" cage (I don't want him to associate his normal cage as a negative thing.) The time out cage still has three perches, food, water, and two toys. After a few minutes I'll pull him out and try again. He already ladders very well and I am trying to train him to only go on my shoulder when I allow it so he does not become shoulder bound. I do work part time but am usually home by 1-2 in the afternoon. During this time he stays in his cage and he is let out when I get home and I have a bird carrier backpack I use to take him just about everywhere else with me since I know they don't like to be left alone. He puffs up a lot and raises his wings at me too. I did get him a vet check and they said he is healthy. Is this a hormonal thing? Is it because I leave him alone for 6-7 hrs in the morning when I am at work (usually just 4 days a week) ? He will go from cuddling and chirping to peeling the flesh off my finger in .5 seconds. I love him dearly and want to try everything to learn him and give him the best life. I was told his approx. 3 years old. However he can be extremely frustrating at times. Today I have felt a little under the weather and while eating some fresh fruit with me in bed he decided to run up and bite my lip making it bleed pretty bad, this is the worst bite I've ever received from a bird and it made me cry which only made him attack me more and more. I used a perch to get him in his time out cage but I am covered in cuts and bruises from bites now. What am I doing wrong? Is this normal GCC behavior or is there something else I can do to help him? He was so gentle the first week he could even preen my eyelashes but now I'm too afraid to hold him near my face. 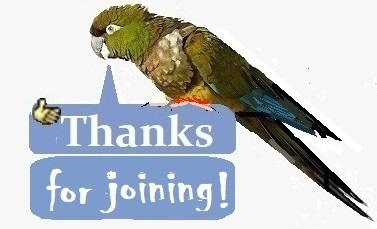 Thank you for helping this bird!!!!!!!!!!!!!!! Here are some very popular links that are often offered to new owners. Meanwhile, I'm glad you're here. We'll stick with you. He has only been with you for a few weeks, so he is still adjusting and learning boundaries. He will need some kind of "birdie time-out" when he bites. Whether it's putting him back on the perch, or placing him on the floor for a little bit, you have to decide what works. Remi left my hands in scars and bruises during the first few months of being with me. With time, our bond strengthened and the biting has reduced tremendously. Trust and boundaries. With time, he settled in a routine, started feeling safe more and more, and wanted to be with us more. You are so right RemiBird. Learning their body language helps tremendously also. You often get an initial 'honeymood' period where your new bird is weighing you up. If it's any consolation I rescued a GSCC after being told it was vicious and aggressive. Unsurprisingly he had had 6 previous homes but was a little angel when I first had him. This made me feel like the bird whisperer but pride comes before a fall and boy do I have the scars to prove it! However I persevered and it took me almost 12 months to gain his trust. Now the snuggles and kisses are well worth all that pain. I'm not saying he NEVER bites but I usually get a warning nip first instead of a savage attack and I'd be a fool to ignore this.Putting him back in his cage for 10 minute time out usually does the trick. 3 weeks is like a day for a bird--- you likely need to slow way down. I feel like a broken record saying this, but my cockatoo didn't step up for 3 months...and she knew how. You are also dealing with a bird who was abandoned. Build trust by doing quiet things near the bird, let it see you put food in the cage (treats) and see if it will take from your hand---do not rush. Do not push food closer (and if the bird won't take food, don't try to touch the bird---even when it does, you shouldn't rush contact). **If you have ANY huts, tents, low-ledges, cave-type structures or nesting materials (cloth, wads of paper, boxes) remove them from the cage ASAP. Any shadowy space can trigger hormones and aggression (Along with other problematic issues/health problems). These places also include blankets, pillows, under furniture, in a hole on your lap etc). Also- NO CUDDLES and pet only on the head...Cuddling a bird can lead to aggression etc due to hormones. It is not fair to the bird and it's like making a promise you can't keep. Last edited by noodles123; 04-15-2019 at 08:53 PM. I would say that basically the "honeymoon" period is over. When I a bird 1st comes home they are more docile and sweet at 1st but then sometimes they can start biting and or screaming all of a sudden. It just means your bird is getting more comfortable with the environment. I agree also that time out is something reserved for a bird who fully trusts you and not one who is new to the home. For now just ignore it or gentle put the bird down (in the closest safe spot) and walk away for a minute or so. I for one used this method with all 4 of my Conures and it works like a charm. I did not need a time out cage. In fact why don't you turn the smaller cage as a sleep cage than you put somewhere quiet and dalrk for them to get their 12 hours of sleep they need which can help with biting also. The "Timeout Cage" is a big no-no right now, but honestly what you provided him with was not a "Time-Out Cage" because it had food and toys in it, lol...That wouldn't do much to begin with, but because he wasn't bonded to you in the first place, he isn't going to listen to you anyway...As stated, to stop biting in a bird you're having biting issues with you just need to start respecting his territory and not EVER try to push him or force him to do anything at all, because if you do you're going to get bitten...And badly. It is overwhelming at times, but you will get there! Thanks for posting and welcome (again). In terms of shunning, I would still wait to solidify trust because being "shunned" may not bother him without that pre-established bond.